Check out the lunch menu! White House Express is a renowned restaurant in Hendon and Golders Green in London. They have served fantastic food for over 20 years. Brightbulb Design met with White House Express who were finding that increasing competition from local rivals was effecting their business. We worked with them to reposition their restaurant through good design and branding to now be recognised for higher quality dining. Brightbulb created a modern brand for White House Express to be implemented across all of their materials. We created a very different style of folded menu for the business, beautifully designed printed with soft touch laminate compared to their previous single page, gloss laminate menu. We have created different denominations of gift cards for the business and the branding has been used across the clothing and signage for the restaurant. 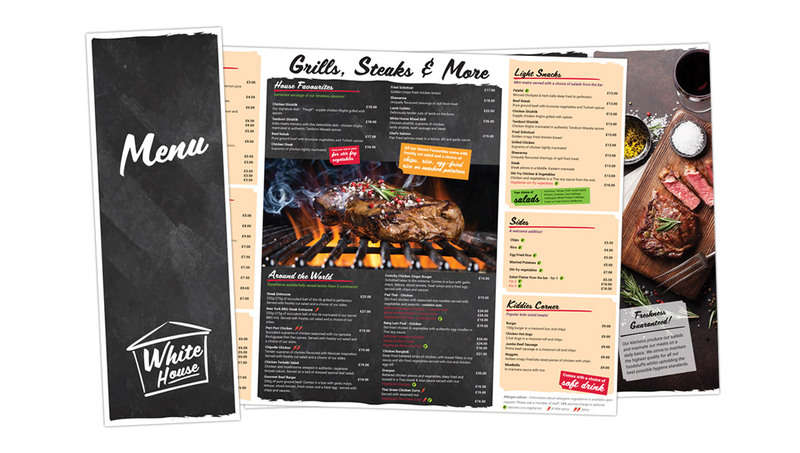 The brand, menu and promotional materials have been very well received by the client and have given them the opportunity to be recognised as a higher end establishment. An example of how a rebrand can make a real difference to how people see your business.